CHILLICOTHE, Ohio, Oct. 25, 2017 – The Kenworth-Chillicothe manufacturing plant recently received the 2017 Encouraging Environmental Excellence Silver Award from the Ohio Environmental Protection Agency (EPA). The award recognizes businesses, nonprofits and government agencies in Ohio that demonstrate commitment to exceed regulatory compliance and attain exceptional achievements in environmental stewardship. Craig Butler, Ohio EPA director, presented the silver award to Kenworth-Chillicothe’s Lex Tisdale, director of manufacturing engineering, maintenance and facilities; and Tracy DePugh, environmental engineering manager, during a special ceremony. “Kenworth-Chillicothe was one of only 18 of the 1,359 reporting facilities under the Ohio EPA program that received either a silver, gold or platinum award. It’s an honor for the plant to earn this special recognition achieved through our employees’ diligent and dedicated efforts to strive for environmental excellence and sustainability, and to engage the local community,” said Rod Spencer, Kenworth-Chillicothe plant manager. Kenworth-Chillicothe environmental efforts include participation in an American Electric Power Ohio program that produced savings of 5 million kilowatt hours at the plant over a two-year period. A project to reduce or eliminate elements in the byproduct of wastewater treatment that enabled its use for strip-mine restoration and composting applications. Rain and snow collection helps to suppress dust on gravel roads and parking areas, and is available for the plant’s fire suppression system. Kenworth uses filter-flushed effluent water from the water treatment system to supply its cooling tower and paint pit water supply systems. In addition, Kenworth-Chillicothe is a zero-waste facility that reuses spent plastic drums and wood pallets. Empty drums are cleaned and used to collect waste materials, such as corrosives that can only be held in containers that meet corrosive material standards. A dedicated distillation and storage process is designed to recover 70 percent of spent solvent for reuse. 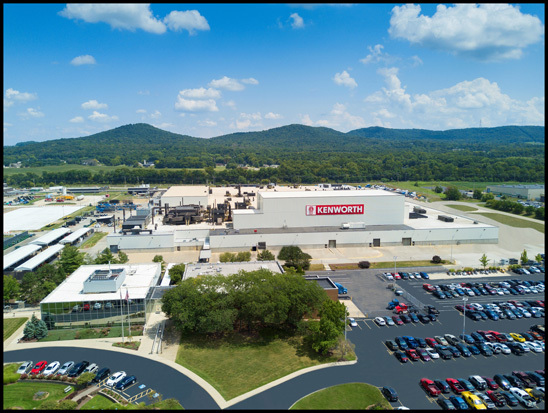 Kenworth’s plants in Chillicothe, Ohio, and Renton, Wash., both hold the prestigious ISO 14001:2004 certification for effective environmental management systems established to help build Class 8 trucks in an environmentally responsible manner. Kenworth’s medium duty products are produced at the PACCAR manufacturing facility in Ste. Therese, Quebec, which also holds ISO 14001:2004 status.